One such unit was I./NAG 12 established at Herzogenaurach in southern Germany during the spring of 1943. The fifteen aircraft of this unit’s 2. Staffel were deployed to the Balkans in the autumn of 1943 and were initially based on the field of Berat (southwest of Tirana) from where they flew sorties alone or in Rotte strength (two machines). The Staffel operated a mix of Gustav variants, having on strength at various stages the G-4, G-5, G-6, G-8 – a dedicated reconnaissance variant - and G-10 sub-types. The unit later deployed to Sarajevo and flew sorties from this base during early 1944 over US-held airfields and ports in Italy. One known and surviving pilot of I. Gruppe NAG 12 was Technical Officer Oblt. Heimo Emmerstorfer, who spent three weeks flying sorties with 2. Staffel during the spring of 1944. His album contained the fascinating photos published here forwarded by Jean-Yves Lorant. Emmerstorfer’s flight log reveals that as a recce pilot he flew 217 combat sorties over 1134 flight hours and – in addition to the Iron Cross 1st and 2nd Class - was awarded the Luftwaffe honour goblet, the Reconnaissance Combat Pilot Clasp in Gold, the Wound Badge in black and the German Cross in Gold. Emmerstorfer never saw combat with Allied fighters at high altitude though the high flying German recce 109s were a thorn in the Americans’ side as a number of strafing attacks on Sarajevo mounted by US fighters bore witness. Emmerstorfer himself was almost caught on the ground on one occasion during 1944. Taxiing out to lead off a Rotte, Emmerstorfer lined up on the strip to get airborne – all take offs were flown in a northerly direction aiming for a gap between the mountains surrounding the town. Suddenly, eight P-47s swept in through this same gap low over the trees directly towards the two 109s just as Emmerstorfer was opening up the throttle to launch into his take off run. Exhorting his Rotte comrade to throw open the throttle - “Alfred, Pulle rein! Amis!” - the 109s hurtled down the runway, travelling so fast that the strafing P-47s were unable to lower their noses and draw a bead. The Messerschmitts disappeared between the mountains narrowly escaping the salvos of fire from the airfield flak defences. 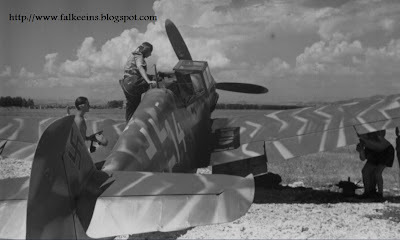 Emmerstorfer was forced to return early to the field with a single flak hit in the radiator – the US fighters having flown just one strafing pass. 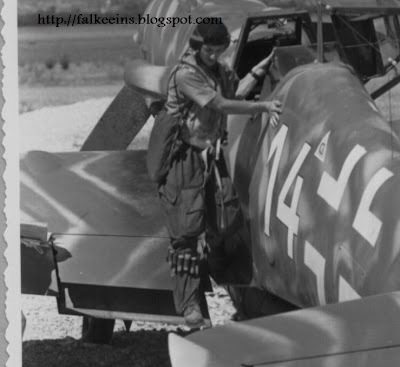 During late 1944 and early 1945, the sixteen Bf 109s of 2./NAG 12 were deployed to Hungary and flew constant sorties from Tapolca as the Russians completed their encirclement of Budapest, threatening the Reich’s last oil fields in southern Hungary. This huge Kesselschlacht (literally ‘cauldron battle’) lasted some six weeks and the Messerschmitt Bf 109 recce Aufklärer were in almost constant action. By May 1945 the Staffel had flown some 2,000 sorties. 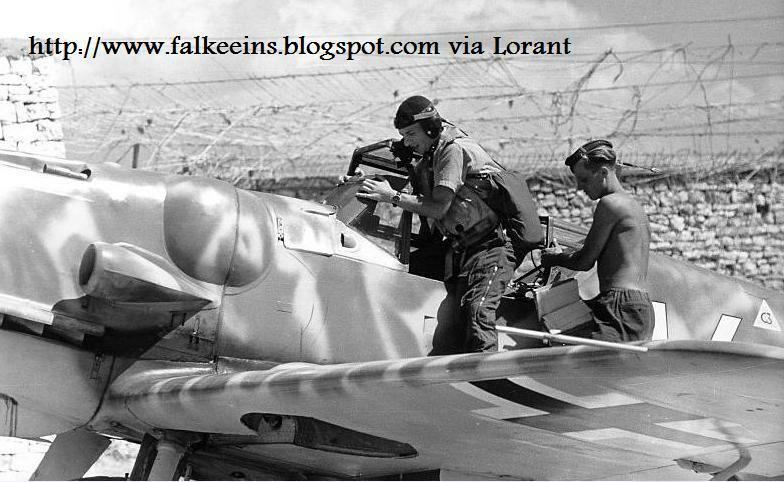 Emmerstorfer himself made his last flight in a Bf 109 on 9 May 1945 - one day after WW II ended. Determined to avoid Russian captivity he was airborne from Ziri, west of Ljubljana – just ahead of the Russians who occupied the field that evening. He flew west in the direction of Austria and reached his hometown of Hoersching without incident. However with American columns on the roads he elected to continue westwards. Finally at 19:35 he belly landed at Haibach on the Danube River and made his way to his parents house on foot. Emmerstorfer is here seen climbing down from ‘White 14’. This image affords an excellent view of the head armour glazing and details of the antenna. The mast is mounted on the rear of the canopy. The zig-zag stripe effect has been airbrushed on free-hand and has a very irregular edge.